I often wonder about this world. And I wonder about the places I want to go and the places I’ve already been. The world has always had its share of evil people. It was true 4,000 years ago, 1,000 years ago and even now. There’s no way of getting away from it. People are people and human nature is human nature. But its hard to understand the extreme to which we are now being subjected. Over the course of the past few years, months and weeks, there is continuous news of man’s inhumanity to man. And I think about those places where I have traveled which are now seeing unfathomable atrocities. The killing just this week reminded me of the trip my wife and I took back in the late 1980s. It was to the Holy Land. The journey was to Jordan, Israel and Egypt. Some would have said it was a good time to go. Others a bad time. But we went nonetheless. We were aware of the tensions between the different countries and hoped our trip would be a memorable occasion for all the good things that we experienced. And it was. 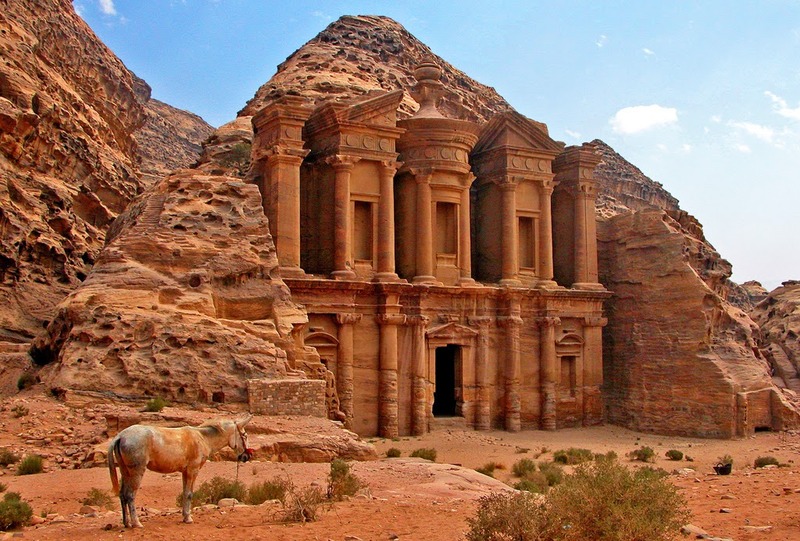 The visit to Petra was the highlight of our stay in Jordan. We were on a tour of about 17 people. From Amman to Petra my wife and I and another couple rode in a taxi. Our driver’s name was Sam. I know that was short for something that had a longer Arabic name, but we enjoyed our all-day excursion with him. After 30-some years, I can’t remember all the details, but the ride by horseback through the canyon that led to the ancient city was an adventure in itself. We visited the Treasury and all the other sites, walking past the numerous residents of the area who were selling their wares. I wasn’t in to spending a lot on souvenirs, although I wish now that I had picked up some handmade items. The day drew on and we returned to Amman. The day-trip was uneventful. It was enjoyable and a good remembrance. It was a good time to go. Would I go again now. That’s a hard question to answer. There were tensions back in the 80’s. As a matter of fact, there have always been tensions in the Middle East. Travel need not stop. We go to New Orleans, which some say is a dangerous place. Probably likewise for parts of Atlanta, San Francisco, Chicago, Detroit and New York.